Sunlight is a very promising source of renewable energy, but a number of "structural'' upper bounds limit the efficiency of solar cells in principle and in practice. The most important effect concerns the band gap of the absorber material: Those photons with energy smaller than the gap cannot be absorbed and are wasted. At the same time, relaxation effects come into play, and energy in excess of the gap is released to the lattice by the electrons and holes excited by photons. Including further losses from smaller effects like black-body radiation and radiative recombination, the efficiency of single-junction solar cells is limited to about 34%, a number known as the Shockley-Queisser limit [1,2]. However, considering the scale of solar cell production and of global photovoltaic installations , even small improvements on the final efficiency of the devices have a huge economical and environmental impact and are intensively pursued by industry. In particular, a big effort concentrates on the reduction of the so-called Shockley-Read-Hall electron-hole recombination due to "trap'' states provided by lattice defects and, in general, of any other intrinsic mechanism opposing electron-hole separation. Working to achieve higher efficiencies, the community is on the one hand trying to further optimize established technologies, such as those based on crystalline silicon, but on the other hand the search for new, more efficient absorber materials goes on. In a recent publication, we have proposed an unexplored alternative, namely to build photovoltaic cells from oxide heterostructures. Lanthanum vanadate, LaVO3 grown on strontium titanate, SrTiO3 (shown in Fig. 1) has a direct band gap in the optimal range for photovoltaics, and can be engineered to have an intrinsic electric field. This field can help electron-hole separation and reduce the recombination rate, one of the key problems of solar cells. A third feature is the conducting interface between LaVO3 and SrTiO3 and the ultra-thin conducting surface layer, providing for naturally built-in contacts for the solar cell. Furthermore, oxide heterostructures make it possible to design multijunction cells in unprecedented, extremely flexible ways. Oxide heterostructures are artificial crystals combining different materials. The excitement about them stems from the fact that, using techniques such as pulsed laser deposition (PLD) or molecular beam epitaxy (MBE), scientists can combine a wide range of different compounds with atomic precision like Lego blocks. 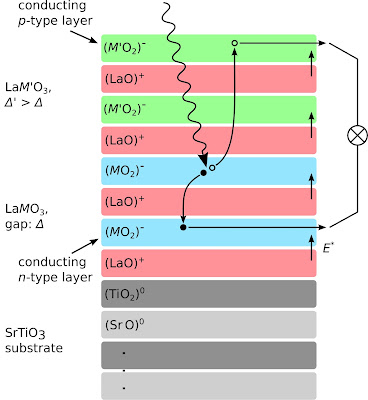 A ground-breaking discovery was made a decade ago by Ohtomo and Hwang [5,6]: The interface between the insulators SrTiO3 and LaAlO3 can be conducting. Thereafter, an intense research concentrated on layered oxide heterostructures. The aim has been not only to engender new physical effects that are absent in the constituent bulk materials, but also to design tailor-made materials and tune specific properties for desired functionalities. As pointed out by one of us , if materials with partially filled d-shells are involved, this flexibility becomes even stronger and therefore potentially more useful. Electrons in d and f shells are strongly correlated, i.e. their mutual interaction effects cannot be described within the standard framework of band-structure theory. Materials containing electrons of this kind often display very pronounced responses to external perturbations, even if these are small. This makes them ideal for use in tailor-made devices. For instance, it is well known that in some bulk oxide materials, like for example V2O3, a tiny change in external pressure triggers a first-order transition between a metallic and a Mott insulating phase, i.e. a phase in which electrons are localized because of strong mutual repulsion. 1) The heterostructure intrinsically develops a large electric field (about 0.3 eV per atomic layer, or in more familiar units: 8 million Volts per centimeter) which will drive negatively charged electrons and positively charged holes in opposite directions, inhibiting their recombination and the losses associated therewith. 2) The electrical contacts to extract the electrons and holes are provided by the material in a natural manner. First, the interface between SrTiO3 and LaVO3 becomes conducting above a certain "critical thickness'' of the (ultra-thin) LaVO3 film. This conducting layer (or "two-dimensional electron gas, 2DEG'') will serve as a back-contact for the solar cell. Second, our calculations show that the LaVO3 surface should similarly develop a conducting layer. However, this conducting surface has to date not been observed in experiments (this could be due to localization by surface defects, for example). If it cannot be realized, an additional metallic layer such as strontium vanadate may be an expedient. 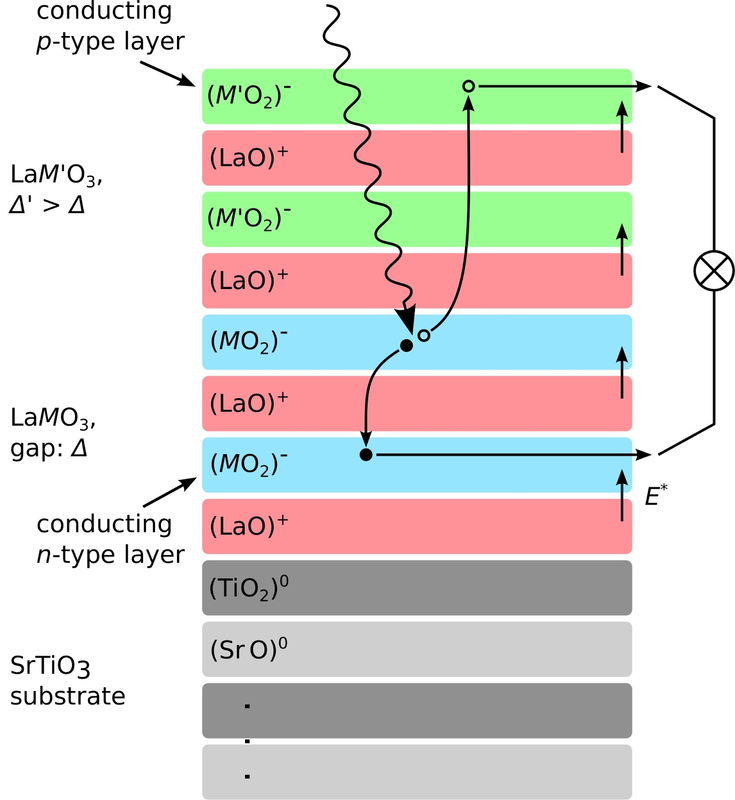 3) LaVO3 (in bulk or in the heterostructure) has a band gap of 1.1 eV, which is near the optimum for single-junction solar cells. In fact, this is the same value as for silicon, but silicon has a so-called indirect band gap. 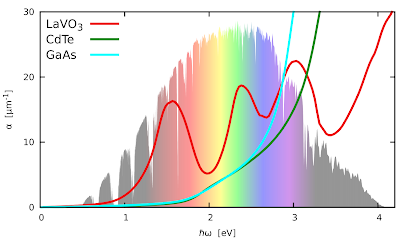 This means that the valence band maximum and the conduction band minimum do not occur at the same k-vector ("momentum'' of the electrons or holes). Therefore, and because photons carry very little momentum, the optical absorption is strongly suppressed (the lattice has to provide the missing momentum in the form of a phonon), and silicon solar cells have to be rather thick. On the contrary, the gap of LaVO3 is "direct'', and its optical absorption is large; in fact, it is large not only compared to silicon, but also to the direct-gap absorbers cadmium telluride CdTe and gallium arsenide GaAs, two industry standard materials for thin-film solar cells, see Fig. 2. 4) The most important way of surpassing the Shockley-Queisser limit quoted above is to combine different materials to create a "tandem'' or multijunction solar cell. As mentioned before, oxide heterostructures can be grown very flexibly; in terms of solar cells, this will allow designing a multijunction cell layer by layer. These four points are also illustrated in Fig. 3. Our theoretical study suggests that layered oxide heterostructures hold great promise as absorber materials for solar cells. We have shown that they can provide a new concept for designing efficient solar cells, including gap grading and reduction of electron-hole recombination. We have reached this conclusion using calculations from first principles. While important theoretical work remains to be done (such as a careful analysis of the excitonic properties and correlation effects), the crucial next step will be experimental work. In order to test whether or not our proposal actually works, experiments have necessarily to be performed. Experimental colleagues from the University of Wuerzburg are already working on that, using existing and new samples of layered heterostructures. We are looking forward to the first results of these experiments. 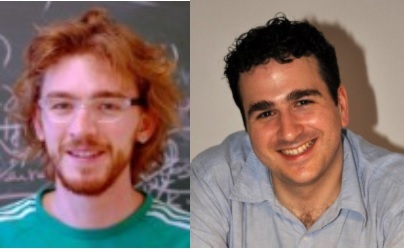 William Shockley and Hans J. Queisser, "Detailed Balance Limit of Efficiency of p-n Junction Solar Cells". Journal of Applied Physics, 32, 510 (1961). Abstract. Albert Polman & Harry A. Atwater. "Photonic design principles for ultrahigh-efficiency photovoltaics". Nature Materials, 11, 174-177 (2012). Abstract. EPIA report, "Global Market Outlook for Photovoltaics until 2016". Full Report. Elias Assmann, Peter Blaha, Robert Laskowski, Karsten Held, Satoshi Okamoto and Giorgio Sangiovanni, "Oxide Heterostructures for Efficient Solar Cells". Physical Review Letters, 110, 078701 (2013). Abstract. A. Ohtomo, D. A. Muller, J. L. Grazul and H. Y. Hwang, "Artificial charge-modulation in atomic-scale perovskite titanate superlattices". Nature, 419, 378-380 (2002). Abstract. A. Ohtomo and H. Y. Hwang, "A high-mobility electron gas at the LaAlO3|SrTiO3 heterointerface". Nature 427, 423-426 (2004). Abstract. Satoshi Okamoto & Andrew J. Millis, "Electronic reconstruction at an interface between a Mott insulator and a band insulator". Nature 428, 630-633 (2004). Abstract. Naoyuki Nakagawa, Harold Y. Hwang & David A. Muller, "Why some interfaces cannot be sharp". Nature Materials, 5, 204-209 (2006). Abstract. Guneeta Singh-Bhalla, Christopher Bell, Jayakanth Ravichandran, Wolter Siemons, Yasuyuki Hikita, Sayeef Salahuddin, Arthur F. Hebard, Harold Y. Hwang & Ramamoorthy Ramesh, "Built-in and induced polarization across LaAlO3|SrTiO3 heterojunctions". Nature Physics, 7, 80-86 (2011). Abstract. Y. Hotta, Y. Susaki and H. Y. Hwang, "Polar Discontinuity Doping of the LaVO3|SrTiO3 Interface". Physical Review Letters, 99, 236805 (2007). Abstract.